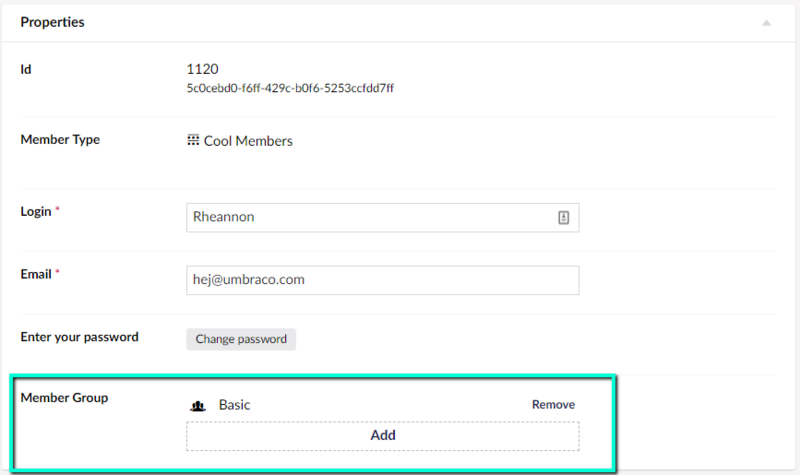 Members are used for registering and authenticating external users of an Umbraco installation (ie. forum members, intranet users and so forth). This guide will explain how to define and create members in the backoffice. If you want to work with members using the service APIs, links can be found at the end of the document. There is a default Member Type that can be used to create members. You can, of course, customize it to fit your needs or create your own Member Type from scratch. Go to the Members section, right-click Members in the member tree, click Create and choose Member. Members have a number of mandatory properties. So aside from filling out the name, you will need to fill out Login, Email and the two Password fields in the Properties group before a member can be saved. Once the Member is created and saved you can access it by expanding the Members tree and clicking All Members to get a list view. You can also view members of a specific type by selecting the member type in the Members tree. You can create your own Member Types and add properties and tabs just as with Document Types. Go to the Settings section, right-click Member Types and select Create. 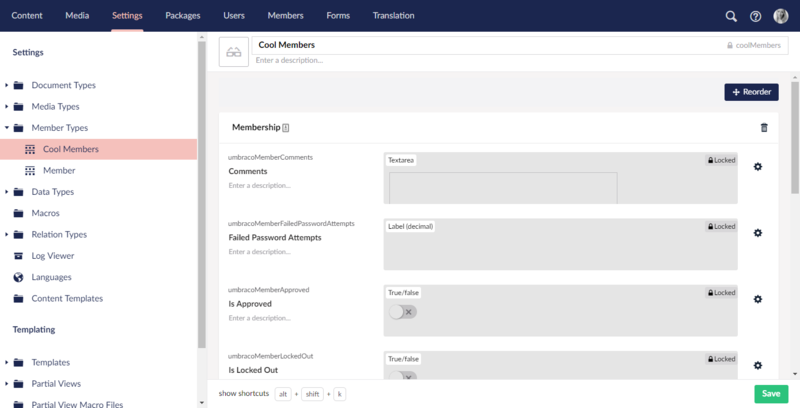 You will now be taken to the Member Type editor that is used to define and edit the Member Type. Name the new Member Type and click Save. 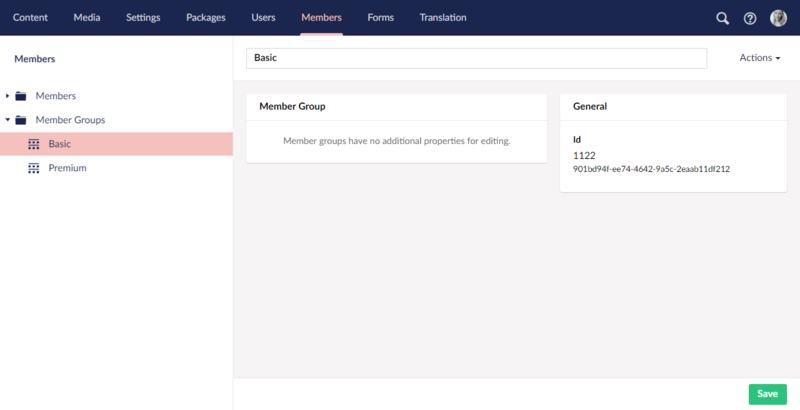 It is possible to add more groups and more properties to each of the Member Types you create, as well as the default Member Type. Member Groups define roles for your members that can be used for role-based protection. A member can be in multiple groups. To create a new Member Group click the menu icon next to the Member Groups node in the Members section. Choose Create, name the group, and save the group. 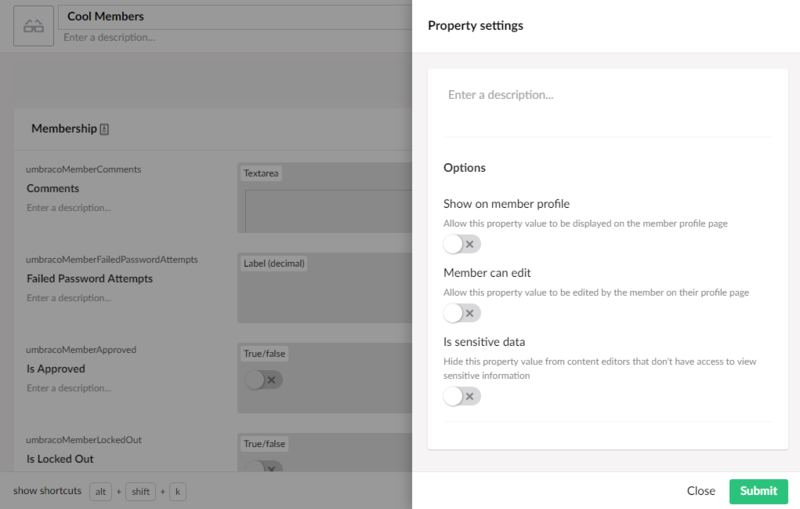 You will have the option to mark member properties as sensitive. Sensitive properties on a members data will not be displayed to backoffice users unless they have appropriate permissions. More information can be found under security. As a developer you are able to leverage your website easily when you build on the Members section of Umbraco. Although the Members section is by default in the Umbraco backoffice, you will be able to implement some work on the front end of your website. Members come from a custom ASP.NET membership provider, while Member Groups come from a custom Role provider. Both are defined in the web.config. You can find out more about the services methods in the reference section of the documentation by following the links below.